Finding the right designer for your home is an important decision, as is selecting the company that will install it. We believe that by being both your design and build company, Mom's will ultimately make your life a little bit easier and your lifestyle a lot more satisfying. To help you see the advantage of a seamless vision from beginning to end, let us introduce you to our unique process. It is the attention to detail in every step that makes your project a success! The first meeting is for us to get to know you and to be introduced to your space. To inspire you, we will proudly show off some of our past achievements. To inspire a plan for you, our designer will listen to your dreams and lifestyle needs. At the end of this introductory assessment, we provide a cost estimate for the next phase: developing a comprehensive design. After receiving the design fee (typically $1,000 to $5,000, depending on size and scope of the project), we are able to move forward and develop a physical plan for the space that you and the designer have envisioned. At this point, the designer will ask for any surveys or architectural plans you may have. To tailor a space around your unique preferences, your designer will spend time becoming acquainted with you, your tastes and your goals for your lifestyle. You may choose to explore magazines and websites such as Pinterest and Houzz to build a collection of images that strike your fancy. This can help you (and us) hone in on your style preferences. In the end, we want you to say, "Mom's gets me!" After gathering the necessary information, the designer heads back to the drawing board where the magic making begins. The designer melds your insights with her or his own creative inspirations drawn from architecture, art, science and the world around us. This culminates into a design - not just any design, mind you - but one that is a meaningful reflection of your unique style and accomplishes your goals for how you will experience your home. The concept presentation is the exciting moment when the designers share their vision for your space: a presentation that includes a hand-crafted scale drawing (a sheer work of art in itself), 3-D renderings, picture pages, perhaps some samples of proposed materials and an feasibility study assessing project costs. These tools facilitate moving onto the next step...turning your dream into reality! The designer works with you to determine the actual scope of the project and to refine some of the details. If needed, we can also recommend an efficient approach to phasing the construction. 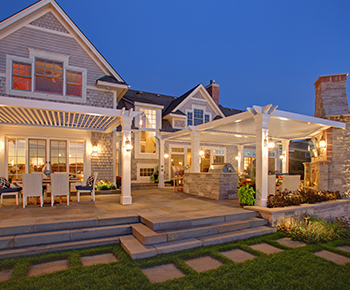 Mom's projects often include custom-designed structures. They are placed and personalized not only to be functional, but to also enhance the overall setting and to beautifully tell the story of your space and how you live. To ensure the story endures, a structural engineer is brought in to develop the details of design and construction. We think you'll agree that the extra cost is worth it. Get ready for the really fun part! Even if you typically don't find pleasure in choosing things like fabrics, lighting, furniture, stone and other decorative elements, your designer is there to guide you and help make it an enjoyable process. It's this personal attention that results in a project with artistry, energy and soul. You're going to love it! Seriously. Alas! It's time to pop open some bubbly and celebrate the achievement of your new lifestyle investment: your completed living space! Your designer (by now your new best friend) will take you on an in-depth tour throughout the finished spaces to highlight the design features, discuss proper maintenance and answer your questions. Hugs all around! Your relationship with Mom's doesn't have to end there. We want your newly created space - and your delight in it - to last for a long, long, LONG time! 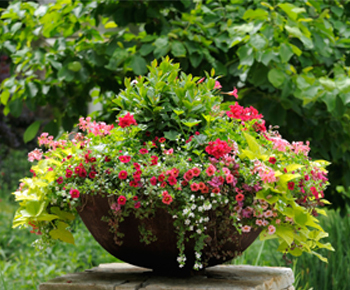 With that in mind, we have created a Fine Gardening Division to help you care for your new landscape. We offer flexible service plans to tailor our maintenance offerings to your property. Mom's will take care of you. We want your new space to endure the test of time. To that end, we have developed our warranty with you in mind. We offer a 1-year plant warranty, 5-year hardscape warranty, 10-year deck warranty, and so much more! Our goal is your peace of mind. Download the full warranty here.